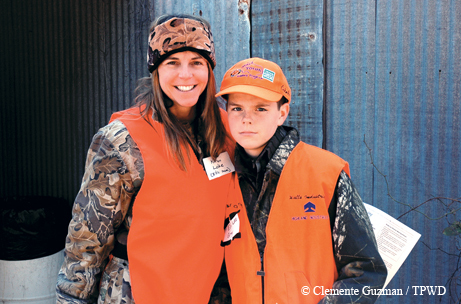 Youth hunting event changes the lives of young participants, including my son. ﻿﻿﻿﻿﻿As we drive up a dirt road into a sea of orange, I glance at my son Eli, 12, sitting quietly in borrowed camouflage. It’s his first deer hunt, and he’s more than a little apprehensive. “But, mom, why do I have to shoot a deer?” he asks me. He looks down at the floorboard where the 1897 Winchester rests inside the old leather carrying case, and his mood seems to lift a little. Fast-forward several years. Today, my now-18-year-old has taken five deer, his first buck and a few doves. Eli now serves as a mentor to other youth on this same youth hunt. That first day, I never realized the impact that the Texas Youth Hunting Program would have on him. Author Karen Loke and Eli, 12, at Eli's first hunt. It’s tough to raise a son alone, and my challenge is increased because Eli has attention deficit disorder and borderline autism spectrum disorder. One thing I learned early in the process was that being outdoors was soothing for both of us. Activities with the Boy Scouts of America became an important part of our lives. I grew up camping, hiking and swimming but not hunting. As a television producer for the Texas Parks and Wildlife Department for more than 20 years, I have spent a lot of time around a lot of hunters. I have been fortunate to work with those who teach hunter safety as well as those who tackle wildlife management. Along the way I learned how habitat supports only a certain number of deer, and I learned the sad reality of what happens to those deer that don’t have enough food, water and shelter to survive. While filming those hunting segments, I saw kids take their first deer and listened to their stories about overcoming the fear of firearms and the pride they felt when they brought home fresh venison. I knew I wanted that experience for my son. 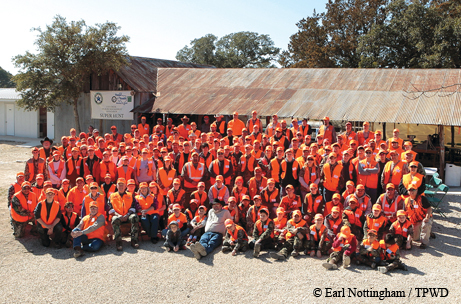 It's a sea of orange in the Cave Creek Youth Hunt group photo. Wildlife Management Association Cooperative. These landowners, most of German descent, have relatively small acreages individually. Combined, they have more than 45,000 acres, and by managing the deer herds together, they cultivate a much healthier deer population. When hunting season comes around, they can add profit to their ranching heritage with hunter dollars. “See those eight or nine deer around that feeder?” my son’s huntmaster, Steve Hall, asks Eli as they sit quietly in a blind on a freezing Hill Country morning on Eli’s first hunt. It’s still too dark to shoot. Eli doesn’t answer, but he looks up. I’m there, too, with a video camera, a little worried that Eli is going to insist on leaving because it’s too cold and he’s not having any fun. But Steve is a pro and a father himself, so he’s patient and distracts Eli with some facts. “That’s too many,” he tells Eli. “Your job is to take one of those does so the others can have a better life. That’s why Mr. Klein is letting you come on his property. And you get to take home some meat. Think you can do that?” Steve gives his own gloves to Eli to warm his hands. Eli falls asleep until the morning sun comes up with the sounds of dove, wild turkey and distant buck snorts. The herd has left the feeder, but Eli will have another chance to hunt that evening. We head back to the main camp where the others have gathered, many with their morning harvest. They begin the hard work of cleaning their deer, quartering the meat and saving the hides for trophies. What stories they will tell Monday morning at school! 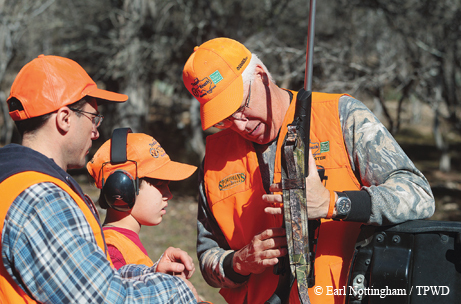 Huntmaster Steve Hall goes over firearm safety with a father and son. Understandably, 60 kids with guns sounds a little scary, but the organizers have a system in place that ensures everyone’s well-being. 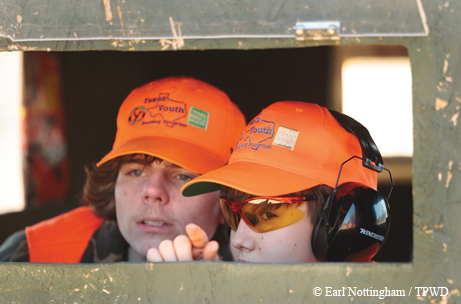 Kids must first pass a hunter safety course that focuses on gun control and hunting ethics. They must earn a marksmanship certificate and learn how to track an animal that has been shot. The main goals are to keep the hunters safe, prevent waste of an animal and teach responsibility. The rest of the afternoon is spent pursuing various hunt-related activities. At one station, kids learn about flint knapping; at another, a game warden talks about the rules of hunting on private lands, crossing fences and the practice of leaving no trace behind. One favorite station is sausage-making, run by one of the landowners, Ronnie Ottmer, who leads this activity every year. Ronnie makes sure that the kids get their freshly washed hands on the meat, feeding the venison through the grinder and filling the casings to prepare part of that night’s banquet. A historic old schoolhouse on the property is the site of all this activity. It was built in 1881, and children once learned reading, writing and arithmetic here. This weekend, kids will bunk here to rest for another learning experience. After making sausage, we head to the range, where Eli makes sure his rifle is in line for that evening’s hunt. I watch as he focuses intently on the target. “The range is hot!” yells the range manager. Eli exhales and pulls the trigger. The target is 75 yards away, so we can’t see if he made the shot yet. Eli takes two more shots before we check it out. I follow with my camera to catch his reaction, good or bad. The range manager takes down the target and shows it to us. “Hot dang, that’s the best I’ve seen yet!” he exclaims. Eli beams broadly and shakes his hand. In a rare display of delight, he turns and smiles at me and the camera. ﻿﻿﻿﻿﻿A age 14, Eli returned to the Cave Creek Hunt and took a fine doe with huntmaster Steve Hall. That afternoon, Steve, Eli and I head back to the same blind. Eli’s feeling much more confident now with his recent marksmanship success. It’s warm and comfortable, and there is time to settle in, look through binoculars, tell some stories and have a snack. Steve and Eli talk about the TV commercials that promote the snacks they’re eating and laugh. I do a quick interview with Steve about all the kids he’s taken on their first hunt and how exciting it is to see them develop. Steve falls asleep. Eli, trying to be quiet, stares at me and sticks his tongue in and out in rhythm to a song he is humming. He plays with his shadow on the blind’s walls, bobs his head back and forth and drums on his cheeks with his hands while pursing his lips to make a funny sound. “Is that your bongo imitation?” Steve asks with his eyes still closed. “Have you ever been asleep when some-one has shot their first deer?” Eli asks. This time, Eli is fully awake to hear the sounds of wildlife stir. The feeder releases its contents of corn, Steve rouses himself, and the two of them start to get seriously focused. Steve tells Eli to check his safety switch, put in his round of ammo and get his safety glasses on. A buck snorts. “Did you hear that?” Steve asks Eli. “He’s barking at you.” Eli grins. It’s fascinating for me to watch my ADD son focus intently as a herd of axis deer walks past our blind. They’re too close and on the wrong side of the blind to shoot, so we wait longer. As the sun starts to set, we hear distant shots from other youths taking their chances. I start to fear that Eli won’t get his shot tonight either, but Eli seems calm and unworried. My son has had trouble at school for being unable to focus, distracting others, squirming in his seat and falling asleep in class. Medicine helped keep him compliant in the classroom but turned him into what he called a “zombie,” so he refused to continue taking it. It was wonderful to see how the time spent in the blind watching deer seemed to calm him like a kind of natural medicine. At long last, a single axis doe comes to the feeder. She’s not huge, but she is big enough to take (and just in time, before she produces more offspring of the exotic species taking over the native white-tailed deer habitat). I focus my camera on the doe but find myself instead looking away from the lens to watch my son. I wasn’t sure if Eli could take the life of another living thing when the moment came, but he had been trained and he was ready. The shot is clean, right through the doe’s heart. She runs a few feet across the creek just as they had prepared him for in class. “Great shot!” Steve tells Eli and pats him on the back. We wait a few minutes before leaving the blind to track her down. It’s getting dark now, and Steve pulls out his light. We find her a few yards away, lying still on her side. Eli pokes her with a stick. “Yep, she’s dead,” Steve says. Eli holds the light while Steve guts the doe. Next time, Eli will do it himself. Eli helps a younger hunter identify a possible shot from a deer blind in 2014. When we return to camp, a banquet is underway. Landowners, huntmasters, hunters and families enjoy fresh venison, certificates of appreciation and memories of the day’s hunt. Afterward, everyone gathers for a group shot. “Everyone say ‘backstrap!” yells Doug Dubois, the youth hunt organizer. Today, Eli is an Eagle Scout and a high school graduate. He’s still a hunter. Of course, you don’t have to be a single mother or work for a wildlife agency to take your kid hunting. 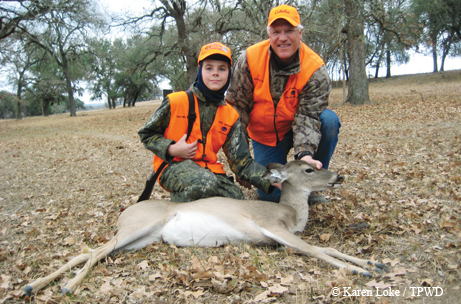 The Texas Youth Hunting Program offers hunts year-round for a very low price. Check out the website texasyouthhunting.com for information and places to hunt all over Texas.